This is the most comprehensive guide to all of the features and tools included with Google Apps for education. This is the place to find the answer to even the most obscure questions you might have. These groups were created to build a community of Google Apps for Education users to support and share ideas related to the integration of Google Apps in the classroom. Joining the midwest regional group will give you access to the technical support help forum and notification of important updates and regional meet-ups. 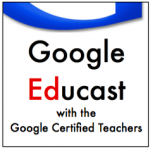 The Google Educast, hosted by the Google Certified Teachers, features a weekly roundup of the newest Ed tools from Google, highlighting best practices using Google tools, and further highlighting the impact that these tools have on the classroom, schools, and school districts.